For five years Laurie Valdez relived her partner’s death. She spoke to people who watched as San Jose State University Police Sgt. Michael Santos, accompanied by Officer Frits Van Der Hoek, fired the rounds that fatally felled 38-year-old Antonio Guzman-Lopez, the father of her then-4-year-old son Josiah and guardian to her then-10-year-old daughter Angelique. She listened to the 911 calls. She read every word of the district attorney’s detailed report that cleared both officers of wrongdoing. She litigated the case in federal court. She shared her grief at public rallies to change laws and in private support groups to comfort families bereaved like hers by police killings. On Feb. 22, for what Valdez says was the first time, she actually watched him die. Surrounded by friends, reporters and San Jose State officials, Valdez pulls her chair up to a conference table to view a 17-minute clip from Van Der Hoek’s body camera. It starts with Guzman-Lopez kneeling on a sidewalk at Eighth and San Salvador streets just outside SJSU proper. He carries his daughter’s purple backpack, a water bottle and the jagged blade of a drywall saw. The two officers close in. Guzman-Lopez stands up, says “it’s OK, it’s OK,” and starts walking. The cops tell him again to stop. Their commands seem lost on Guzman-Lopez, an undocumented day laborer who spoke only broken English and, a toxicology report later found, was addled by drugs. He keeps moving. Van Der Hoek fires his stun gun and throws a baton toward Guzman-Lopez, who loses his balance and falls to the ground. Van Der Hoek yells to Santos, “Shoot him, shoot!” Shots fire. Almost everyone in the room watching the clip gasps and tears up. Valdez starts sobbing. Charlie Faas, San Jose State’s vice president of administration and finance, hits pause to give her a chance to regain composure. Once she does, the footage resumes with the officers cuffing Guzman-Lopez even after he’s shot. Face down on the sidewalk, he gasps for breath as officers cut off his blood-soaked clothes. Thanks to a new law, police video once available only to authorities and few others will become public to anyone who asks. Though Valdez had long since made the details of her case public and once declined a chance to watch the same recording at the Santa Clara County District Attorney’s Office with her lawyers because she wasn’t ready, she opened up last week’s viewing to the media in part to call attention to the new legislation. Her hope, she says, is that it provides a counterpoint to official narratives about police force. “Now everyone will know the truth,” Valdez, 54, says. Of course, how people interpret the facts is another matter entirely. AB 748 becomes law on July 1. Assemblyman Phil Ting (D-San Francisco), who authored the legislation, modeled it after a Los Angeles Police Department policy to release videos within 45 days of an incident unless it interferes with an ongoing investigation. Together with SB 1421, a law effective since Jan. 1 that requires police to release information about sustained misconduct, it stands to dramatically bolster transparency in a state that has long been one of the most secretive in the nation when it comes to law enforcement. Valdez, through a group named after her son called Justice for Josiah, aggressively lobbied for both bills. And as soon as she could, she asked for public records on the two officers involved in Guzman-Lopez’s killing. The recent viewing of the body cam footage was the first part of the university’s response. Next comes a public release of the same video followed by the disciplinary dossier on Van Der Hoek and Santos. In addition to a host of journalists who filed records requests the moment the option became available at the stroke of midnight on New Year’s Day, at least 10 South Bay families each initiated a similar process. That includes relatives of Steven Juarez, a man who died in 2018 by a policeman’s carotid chokehold that the DA last week ruled lawful after a near-one-year investigation. Now like never before, Valdez says, the public has power to scrutinize the DA’s summaries of cop-caused fatalities, which deem virtually every such incident justified. If Guzman-Lopez’s killing—the first local case in which body camera footage played a critical role—has shown anything, it’s that visual documentation doesn’t always provide the kind of clarity that reformers would hope. Two sides could view the same video and come away with vastly different conclusions. In the footage of Guzman-Lopez, Valdez saw a homicide. Prosecutors saw a legally justified shooting, as did judges in trial and appellate court. Police fulfilled their duty, according to Faas. Charisse Domingo, a criminal justice activist for Silicon Valley De-Bug and a personal friend of Valdez, watched the same video that morning and thought otherwise. She saw grave miscommunication, overreaction and a failure to de-escalate. She saw Van Der Hoek proceed to mark evidence at the scene, which she says she found surprising since his actions automatically made him part of a use-of-force inquiry. She saw details absent from police descriptions of the incident, like a baton thrown after the stun gun activated and the “it’s OK, it’s OK,” that became Guzman-Lopez’s last words. Courtney Macavinta, co-founder of youth advocacy group The Respect Institute, also watched the clip with Valdez and Domingo and came away with an impression like theirs. If the powers that be deemed the Guzman-Lopez shooting lawful, Domingo and Valdez argue, then maybe the metric should be changed. To that end, the new laws opening up body cam footage and misconduct records to public view could bolster the case for updating California’s use-of-force standard for the first time since 1872. Assemblywoman Shirley Weber (D-San Diego) introduced a bill that would allow officers to use deadly force only when necessary, as opposed to when “reasonable” under the status quo. Justice for Josiah hosted a toy drive and holiday party for children left fatherless or otherwise bereaved by police use of force. I observed 7 unjustified killings in my career, it’s not a matter of prosecution, it’s a matter of having these poorly trained, supervised and led people being accountable. You don’t need cops with cameras, you need cops who act without the need for cameras???????????????????????????????? Of the “7 unjustified killings” that occurred in CA, how many were cleared by authorities? What no link to this savage killing? From your description of this shooting I’m going to side with the police. About one cop a week is killed by gun fire knifings much less, as most cops are armed and protected with a vest unlike thousands of civilians killed with knifes. Double that number for other on the job deaths. Charging a cop with a gun drawn or anyone for that matter shows complete disregard for those persons involved including himself. A 14″ dry wall saw might not be my first choice to go on a killing rampage, but hoped up on meth you could easily take down a number of unprepared snowflakes on a collage campuses . Do bad cops make mistakes? Yup that’s why they get reviewed. Next case! Let us not forget that Antonio Guzman-Lopez had five prior occasions of resisting arrest (including swing on officers), battery on a girlfriend, and was reported to have been peeping through a child’s window (in the past). On the day of the shooting he was high on meth and had a rusty 14 inch saw blade with him. Domingo says the standard should be changed and figure out how to prevent these killings. Well how about NOT being high on meth wandering the streets with a weapon/saw blade?? Come on people, personal responsibility for your own bad actions that put yourself and others in jeopardy is the issue. The cops did their job. I can’t imagine that releasing the video to the public will be helpful. Law Enforcement has the awful responsibility of assessing a dangerous situation in a tiny amount of time with multiple threat factors – drugs, criminal history, behavior, alcohol, environment. I would like to see Law Enforcement have other options at their disposal – rubber pellets, shooting a net? Isn’t there some non-lethal option we can come up with other than shooting? I know, meth gives people super-strength but somebody put on their thinking cap! In Viet Nam I killed the enemy. On the streets I found that fantasy ruled the killing of suspects. You don’t kill unless you want to. Every cop knows when it’s a bad kill and they cower away from you. Soon you drink, get divorced and put your gun in your mouth. It is against human nature to kill w/o absolute verified need to do so. I never knew an officer who survived his unjustified killing. “I was in fear for my life” doesn’t work when you try to go to sleep. If you kill as a cop it’s because of bad judgement and lack of asking for resources to decrease the requirement. 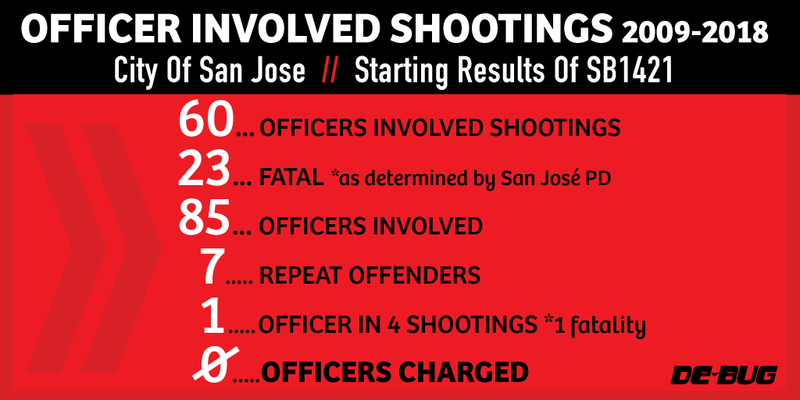 San Jose PD is full of losers, more so then when I was there. Speak a da Spanish . There *are* ‘less lethal’ options and most PD are equipped and trained to use them. But often they aren’t 100% effective and police have no choice but to use a firearm. An assailent can deliver a fatal knife wound to a cop if less than ~21 feet separates them. It takes less time to close that distance and inflict a potentially fatal stab wound than a cop has time to draw his/her firearm (see Tueller distance). Even someone shot in a vital area such as the heart has sufficient time (10-15 seconds) to kill or severely injure another before they collapse from low blood pressure. If armed, they would be capable of emptying a 10-round magazine ( one can easily fire 2-3 rounds / second). Police are trained to aim at “center mass” in most situations. A “center mass” hit is intended to stop a threat – but not to kill. In hostage and a few other situations, a (fatal) head shot is justified. Properly aimed, the bullet hits the brain stem and results in immediate death. But if not, hydrostatic shock to the central nervous system typically results in immediate incapacitation and rapid death. Even so, about 9% of head shots are not fatal. About 75% of the time, gunshot wounds are survivable if blood loss is promptly stemmed. Do note that ‘less lethal’ projectiles such as rubber bullets can kill too. Most street cops never use their firearm beyond requalification. Only NYPD (AFAIK) report accuracy. Only about 14% of their shots actually hit their target. That results in a fair amount of misses and collateral damage. While nice to advocate shooting an assailant’s arm or leg as in the movies, the reality is that most PD are severely challenged to hit center mass. If they hit a limb, it’s probably because they missed. SWAT officers are an exception. There’s a downside to adding more gear for a cop to carry. In high stress situations, it’s not uncommon for PD to mistake a Taser or similar equipment for their duty gun. The wrong choice can lead to a fatality – either the officer or the miscreant. This was the case in a recent BART shooting. Why conceal video or other evidence from the public? I can imagine many beneficial aspects. “Officer caused deaths” There is zero accountability for ones actions on the Democratic plantation. The slaves think these politicians are on their side. I cant stop laughingwhen I read this garbage and the microphone that is handed over to the fringe radicals and law breakers.